Your show dog demands and deserves specialized hair treatments geared toward his or her individual grooming needs. If you're noticing your dog's hair becoming dry, brittle or dull, try our line of Royal Treatment products. Royal Treatment shampoos, conditioners and leave-ins contain one of the world’s rarest oils: Moroccan argan oil. Moroccan oil is known for its antioxidant properties that quickly transform even the driest coats without weighing them down. Deliver essential vitamins and add UV protection to create soft and manageable hair that shines naturally. 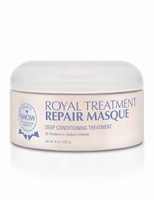 We offer a range of products in the Royal Treatment line. Use the shampoo for a rich, creamy lather that's even save for chemically-treated hair, then follow it up with a concentrated hydrating conditioner to gently detangle and repair the coat without adding any extra weight. You'll see frizzy ends disappear and coats returning to their natural lustre after even just one treatment. A deep conditioner should be applied to coats suffering from extensive damage to help nourish and repair hair from within. Use our maintenance spray anytime hair needs instant hydration. This non-greasy formula is recommended for stubborn coats prone to knots and mats. instant hydration to both the coat and skin. Marula oil helps to restore and seal dry, damaged ends. Rough coat textures become smooth, soft and shiny. Use when working through knots and matted coats. Works on repairing the coats before bath day.